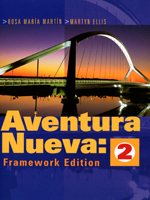 Aventura Nueva is a communicative three-part Spanish course in line with the latest curriculum changes - including the Key Stage 3 Strategy - and is suitable for a wide ability range. Aventura Nueva 2 builds on the language and structures learnt in Aventura Nueva 1, developing students' confidence and knowledge of Spanish. &#61623; ICT: links to Spanish-language websites and exploitation activities giving ICT practice. - Established, best-regarded current course on the market. - First Spanish KS3 course to be written specifically for Languages Framework. - Motivating and interesting approach to Spanish.